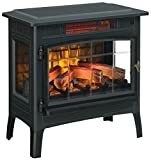 Duraflame Electric - DFI-5010-01: Space Heater • The Air Geeks, reviews of air conditioners, dehumidifiers and air purifiers. As the cold weather rolls in, you may want to install some extra heating source for your home and potentially one that is aesthetically pleasing. There are many options that offer authentic real-looking flames that provide a cozy feeling while you get warmed. Duraflame DFI-5010-01 Electric Infrared Quartz Fireplace is one that promises supplemental zone heating without raising energy bills significantly. Let’s dig in and investigate some of its features and see if they can help us achieve that cozy warm feeling that this heater promises. This heater comes with bronze and black colors to give a warm and comfortable feeling in the house. It comes with a sturdy metal design with plastic legs to ensure it is durable and, at the same time, does not damage your floor. This means it won’t develop dents or corrode easily and it is going to serve you for a longer time. There is also a beveled glass design for best flame viewing. Flame quality is at its best and ultra-realistic as it employs a patent pending 3D flame technology to give an impression of a real flame. The flames dance realistically on and behind the embers to give it a cozy feeling. Your visitors will not want to touch the appliance, thinking the stove could burn them unless you tell them otherwise. The flames can be adjusted using one of the five flame and speed settings. Whether you want to go with just glowing embers or full flames, you have total control over how the flames behave and the general ambiance in the room. The powerful infrared technology enables it to warm spaces of up to 1000 square feet, producing about 5200BTUs of heat energy. This will help save on the money that would have otherwise been lost if you opted to go with the main heating system. Infrared heating technology has been known to be very effective in creating a comfortable heating solution that does not dry up the air. This means it won’t counter your humidifier if both happen to be running at the same time. The heater is friendly to both kids and pets. The exterior surface is cool to the touch so no one will burn themselves, particularly children if their curiosity leads them towards this appliance. There is an overheat protection that turns off the heater in case it detects abnormally high temperatures. There is also a mercury-based topple detection switch that will automatically switch off the device if it is knocked over by kids or pets. A patent-pending Safer Plug technology should give you some peace of mind. If there is a power surge that causes the plug to overheat at the outlet, the plug will immediately cut off power to the heater to prevent explosions or damage to the heater. A digital control panel is concealed by the operable stove door and lets you configure the thermostat as well as the timer. A handheld remote controller will help you adjust various options without having to move away from your chair. The multi-functional control panel will also help you change the flame brightness and speed. This heater is 28.6 pounds which is relatively portable since it doesn’t have large dimensions. You should be able to relocate it from one room to another without any problem. As an infrared heater, we expect it to be very quiet and this particular model doesn’t disappoint. You can comfortably use it in your bedroom or study area without having to worry about loud flame clicking sounds. It doesn’t have a fan so you can expect maximum silence. Accessories Included Remote Controller, Safe Plug. The heater is very quiet: If you love quiet rooms when sleeping, the heater is very efficient. Realistic flames. Love the beveled glass on the door and side panels. Heats as advertised. Easy out of the box, attached the legs, ready to go! Remote lets me set the tone for romantic flames and cozy feel. I love this little stove!" I have to admit, very realistic look! From the front or sides, the flames look real. The unit puts out good heat without being hot to the touch. While being made of plastic, it looks like it's iron. The front door gives it the final touch of realism. Takes 5 minutes to assemble the legs, each with 3 screws. I love this product! Money well spent." If you are looking to go with an infrared heater, this should be a perfect one. It is very attractive and features a compact and sturdy design that will go well with your room interiors. It will also provide fire without having to necessarily give you heat. The traditional antique design gives an eye-catching contemporary look that should be very attractive to your visitors and friends. Duraflame DFI-5010-01 is definitely a good deal for you to take before the frosty weather kicks in.